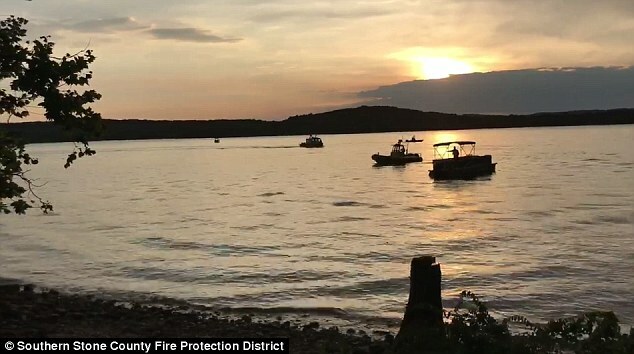 A woman who lost nearly her entire family on a doomed duck boat ride in Missouri on Thursday night says passengers were told: 'don't worry about grabbing the life jackets'. 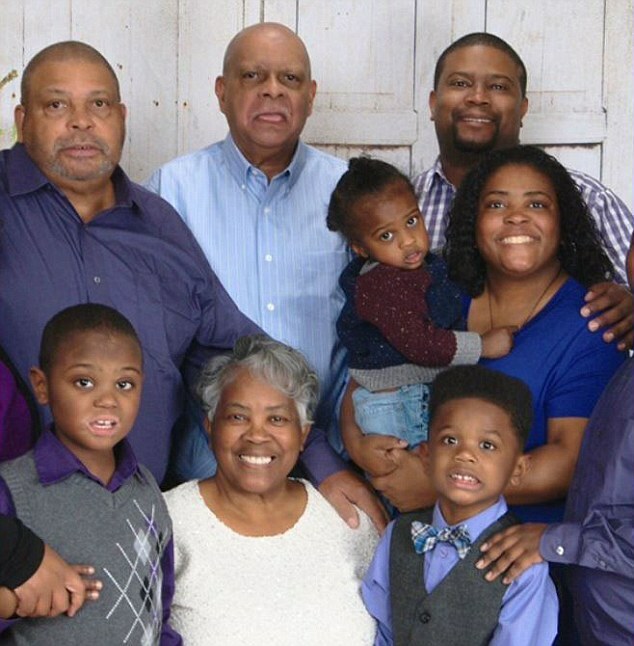 Tia Coleman, who lost nine members of her family, including her husband and her three children, was one of only 14 people who survived when the Ride the Ducks boat capsized on Table Rock Lake in Branson, during a sudden and severe storm. She told FOX 59 11 members of the family, including herself, had been on board at the time. 'My heart is very heavy,' she said. DailyMail.com has attempted to contact Ripley's Entertainment for comment on Tia's claims. It is legal to be on a commercial vessel without a life jacket in Missouri. Speaking from her hospital bed, Tia tearfully told Reuters of her horrific experience trying to get out of the boat. 'Then I just let go, and I started floating, and I was floating to the top and I felt the water temperature raise to warm, and I jumped up and saw the big boat that sits out there. 'When I saw [the first responders helping survivors on the pier], they were throwing out life jackets to people. And I said: 'Jesus keep me, just keep me so I can get to my children'. Only Tia and her nephew survived. A picture submitted to media outlets by the family shows eight of the nine Coleman victims, stretched over three generations and including at four children - three of whom were Tia's. Family patriarch, 'Butch' Coleman was remembered on social media as a 'community legend', who spent more than 40 years volunteering in his community. A woman who met the Coleman family before they boarded revealed they had only been on the doomed boat because they'd gone to the wrong pick-up area. Tracy Beck, of Kansas City, says she and her family were waiting in line for another boat when the Colemans stopped talking to have a group picture taken by the tour company. Beck says the ticket taker realized the family should have boarded at a different location in Branson. The Colemans had to get new tickets and was put on the boat that eventually sank. 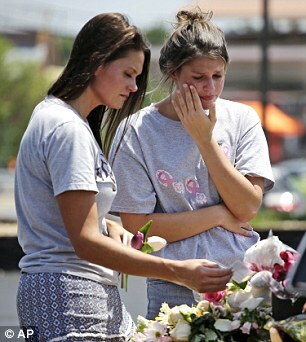 Beck said she recognized the family when pictures began circulating Friday. Officials say there were life jackets on board the sunken duck boat, but it is not yet known how many people were wearing them. Jim Pattison Jr, president of Ripley Entertainment, which owns the vessel, told CBS the boats had life jackets on board, but Missouri law doesn't require people wear them. 'Usually the lake is very placid and it's not a long tour, they go in and kind of around an island and back. But Pattison said the boat 'shouldn't have been in the water' if conditions looked rough before the amphibious vehicle entered the lake. The US Coast Guard confirmed to the Kansas City Stay the doomed boat was called Stretch Duck 07 and was built in 1944, during WWII. Boats built in that era were used to deliver cargo from ships at sea directly to people on the shore. Local bar manager Becca Blackstone, confirmed there is no encouragement to wear the life vests. She told the New York Times she'd ridden the duck boats four times in 10 years, and nobody was ever required to put on the safety jackets - though they were always on board. The tragic boat was not the only one in the water though. Video taken from a second duck boat, which made it back to shore with no incidents, shows massive waves crashing along the side of the vessel into the clear canopy, as rain pelted down on top of them. Other survivors from the doomed ride report the canopy on their boat had played a part in the loss of the 17 victims. Texas woman Mandi Keller told USA Today her 15-year-old daughter Gillian was one of the lucky few on board who survived. Gillian had been visiting her father, Keller's ex-husband, when she boarded the Ride the Ducks boat. Her ex-husband had told her those on the boat were trapped under its canopy as the vessel began to sink. After some time, one of the operators of the boat was able to open the canopy, allowing terrified passengers who were sinking into the lake to swim to freedom. But by then, the boat's downwards pull made it difficult to escape, and was 'sucking' people back into the lake as they tried desperately to make it to the water's surface. Karen Abbott, the sister of one man who died on the boat, said it was unacceptable that the company did not enforce the use of life jackets. '[Ride the Ducks Branson] take people on water where no one knows how deep it is, in a vehicle that goes on land and water. They don’t make you wear life jackets! It’s ridiculous!' she said. 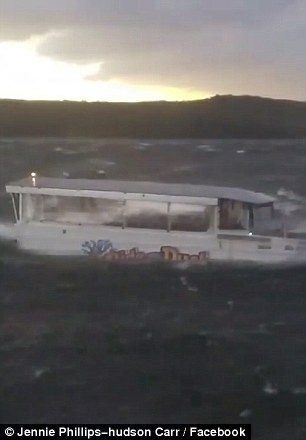 Video taken of the duck boat showed it being lashed by waves and rain for about five minutes before it slowly began to sink shortly after 7pm. The clip cuts out just as the boat appears to tip on its side. Heartbreaking pictures taken from the shore show first responders running to a nearby dock so they could pull survivors who made it to the surface out of the water. Emergency services spent hours diving to try and recover bodies and look for missing passengers. By midnight, the death toll sat at 11, with many still missing. The next day, six more were pulled to shore. 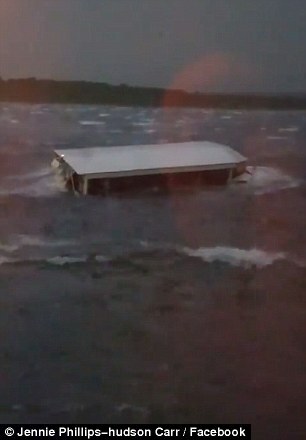 Fourteen people survived, including the boat's captain. Seven people were hospitalized with injuries. Those who died range in age from one to 70. 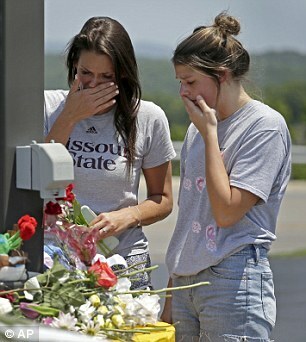 Branson, a Missouri town known for its country shows and entertainment mourned for those who died on Friday in two separate vigils. In one, about 300 people gathered in the parking lot of Ride the Ducks of Branson and sang 'Amazing Grace.' 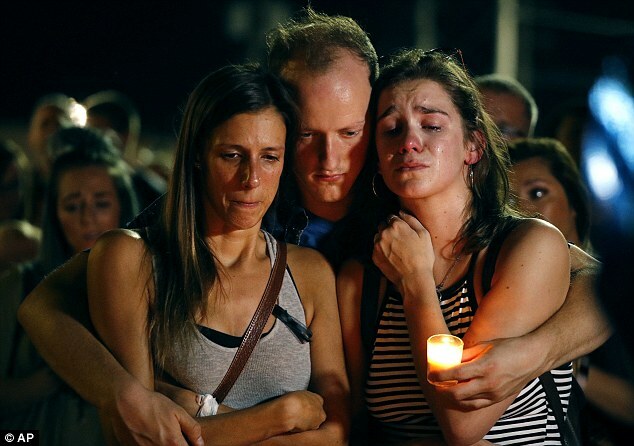 Mourners at a church sang the same words. Meanwhile, a Philadelphia lawyer whose firm has represented families in accidents involving duck boats, is calling for the amphibious vehicles to be banned altogether. Andrew Duffy says the boats are 'death traps on both water and on land' in an interview with USA Today. Missouri Sen. Claire McCaskill now wants to take legally binding action to prevent future tragedies. The Democratic senator says she'll examine 'legislative solutions' to increase the safety of amphibious vehicles like duck boats after the tragedy in Branson. McCaskill didn't offer specifics after she was briefed Friday evening by officials from the U.S. Coast Guard and the National Transportation Safety Board. Both agencies are investigating Thursday evening's accident. The state's other senator, Republican Roy Blunt, also was being briefed by the agencies. He said he will monitor the investigation closely and called it 'a tragedy that never should have happened'.